Thanks so much to all the practitioners who have sent us guest blogs about using Talking Mat in a Criminal Justice setting. Here are our top 5 – in no particular order! This entry was posted in Autism, Blog, Child protection, Children and young people, Communication difficulties, Criminal justice, Learning disability, Legal, Mental Health, police, Safeguarding, Talking Mats principles, Training and tagged Autism, Communication difficulties, Disclosure, justice, Learning Disability, Mental Health, person centred, police, prison, safeguarding, Talking Mats, Training, Young people on January 24, 2019 by Lois Cameron. Last week I threw used deodorant canisters at an audience of earnest professionals and was cheered for doing so. What was going on? I run The Sensory Projects an organisation that aims to share the knowledge and creativity required to turn inexpensive items into effective sensory tools for inclusion. In all I do I am working to contribute to a future where people are understood in spite of their differences. The empty deodorant canisters had been washed, their roller balls removed to enable me to fill them with festive scented balm – some frankincense some myrrh – with balls replaced they make wonderful massage tools enabling me to form a connection through touch and smell with persons of all abilities and to share a sensory conversation around the season. I lobbed them at my audience to bring to life the new Core and Essential Service Standards for Supporting People with Profound and Multiple Learning Disabilities. That title might not sound exciting and the link with my improvised massage tools might not be immediately apparent but I promise you the link is there and the document is very exciting indeed. My original dream when I set up The Sensory Projects was to write five sensory stories. That dream was a bit of a fantasy and so I had to pinch myself when it came true. The original five stories are sold to fund the writing of more and there are now twenty available on the website. The stories led to books, of which there are five in print currently and a few more in the pipeline. The stories project led to another project, which led to another, and there are four currently and a fifth due to start next year. Through the projects I have had the chance to do some remarkable things and found myself in situations I never imagined I would be in: I’ve been featured in a book given away in Lush stores globally, I’ve been interviewed on Radio 4, I’ve done a TEDx talk, I’ve even exchanged text messages with the Foo Fighters! If I continued to pinch myself when remarkable things in my life happened I would be black and blue by now. And yet of all of these wonderful things and the many adventures I have had, by far and away the best thing I have been a part of is the new Core and Essential Service Standards for Supporting People with Profound and Multiple Learning Disabilities. The new Core and Essential Service Standards for Supporting People with Profound and Multiple Learning Disabilities is a document that describes what best practice care looks like when supporting people with profound and multiple learning disabilities. It is beautifully simply having just 7 standards for what best practice looks like at an organisational level and 6 standards for what it looks like at an individual level. It was written by a team of volunteers over 140 strong over an 18 month period. It represents an enormous work of effort and hope. I am humbled and proud in equal measure to be one of its four lead authors. If adopted by the inspecting agencies it would change the face of what care looks like for individuals with complex disabilities nationwide and influence care provision globally. Even without being adopted by the inspecting bodies it is having an impact. I encourage all settings to take a look at it. If you are a great setting celebrate that you meet the standards, declare it publicly, display it on your website, tell the world – and help us to create an expectation that this is what care should look like. If you are a middling setting celebrate that you are working towards the standards, use them as a reflective tool to drive up the quality of care that you offer. And if you work in a duff setting….well, I spoke to one woman who worked in a setting where the management were thoroughly uninterested in supporting their residents with profound and multiple learning disabilities. She looked through the document, thumbing the forward by Norman Lamb and the endorsement by NHS England, she gave me a wry smile “I don’t think my boss will know this isn’t legal” she winked, “I’m just going to give it to him!” However the change comes about, we want to see these standards upheld. Early on in the writing process we had to make a decision: were we going to describe what best practice care looked like now, or what it ought to look like. We went with what it ought to look like. This is an aspirational document. But that is not to say it is unachievable. I cannot emphasise the “ought to” strongly enough. The first standard for individuals is communication, within the explanation for this standard is the following: “Communication should be a collaborative activity, it has to be a two-way exchange; reciprocal and responsive.” That is not asking a lot. It is a shame on our society that such basic standards are aspirational at all. It should already be happening. We launched the standards at an event called Raising the Bar last year. Raising the Bar II was held this year and looked at how far we had come since the launch. One speaker told the room full of delegates “before you seek to raise the bar you must allow family members to say where the bar is currently” and we did. Families presented about the level of care their loved ones had received and their stories were horrific to hear. The bar is currently set very very low. Standards such as two way communication are aspirational. It is so low that it should be easy to raise. Simply by being aware of what we should be doing, making others aware, and expecting to see positive change we can go some way to improving care. Raising the Bar III is due to be held at Birmingham University next year on the 25th of October. Most importantly of all we want families and primary carers to know about the standards so that they can use them as an advocacy tool and demand that settings meet them. There is a community of practice hosted on Facebook that networks people working together to see this change come about. Please join us. Standard two is about health and wellbeing and describes how staff will have an awareness of what good mental health looks like for an individual and how to support it. Smell has a particularly powerful effect on the emotions and fostering an engagement with smell is a good way of supporting someone’s mental health – regardless of their ability, disability or neurodiversity. On my Sensory Engagement for Mental Well Being training day I look at many simple sensory strategies for supporting mental health for people with complex disabilities. A document like the standards can seem dry and impersonal, throwing things at my audience helped me to bring it to life. My whole working life, and much of my private life – I have worked for inclusion in mainstream education settings, I have taught in a school for children with severe and profound special educational needs and disabilities, I have inspected schools for their provision for children with additional needs and provided consultancy services to schools looking to improve their provision, I have family members with neurodiverse conditions and physical disabilities, I have been a registered foster carer for children with severe and profound special educational needs and disabilities and I have run The Sensory Projects – has been about working to see people be better understood, better included and better appreciated for being themselves. The Standards are the pinnacle of all of this work. You can download the Standards for free from the PMLD link website: www.PMLDlink.org.uk by following the ‘Resources’ tab, or from my own website www.TheSensoryProjects.co.uk – again follow the Resources tab. Please print them off and share them far and wide, make sure everyone you know who is involved in the lives of people with profound and multiple learning disabilities, or has influence over their lives in anyway, knows about them. Together we will create this change. I also warmly invite you to join us on the Community of Practice, let us know who you have shared the Standards with, it is great to hear what others are doing. This entry was posted in Autism, Blog, Communication difficulties, Learning disability, Participation, person centred approach and tagged Communication difficulties, Participation, Personalisation, standards on December 6, 2018 by Lois Cameron. 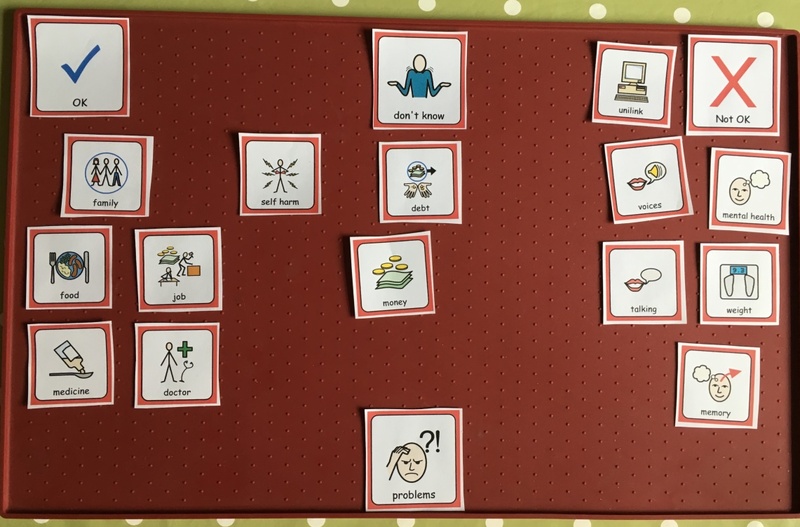 This blog by Jacqui Learoyd explores her role in setting up a speech and language therapy ( SLT ) service in a prison and her use of Talking Mats in that setting . HMP Berwyn is a large prison which opened in February 2017. To help you understand the challenges facing me when setting up this service in a new prison, I’ll tell you something about prisons, the people in prison, and the healthcare provision at HMP Berwyn. 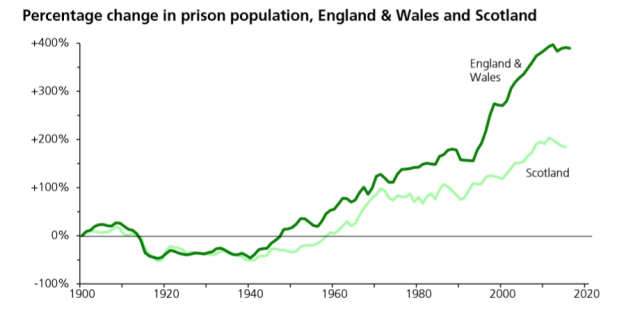 In the UK the prison population is just growing and growing. The graphic above is taken from the Commons Library Briefing of April 2017 so that you can see the trend. The number of people in the prison system as of April 2018 is 83,617. The reoffending rate is about 30%. From this data alone, we can see that something needs to change in order to reduce offending and re-offending. Part of the ‘something which needs to change’ is considering offender rehabilitation / prison reform. This led to the building of the UK’s newest prison – HMP Berwyn. We tend to shorten the name of the prison to just ‘Berwyn’, so that is what I will call it in this short piece. Berwyn has a focus on rehabilitation and treating people as individuals. We aim for the provision of high quality healthcare. We have space for 2106 gentleman – which makes us quite a large facility. We also give attention to the words which we use in our daily conversations – the clients are not called prisoners, but ‘men’, the cells are ‘rooms’, people are called by their first names, etc. The healthcare provision is an integrated multidisciplinary team with a mix of professionals offering a range of skills. It’s called the Health and Wellbeing Team as it offers holistic care to our clients. I’m happy to say that this includes full time Speech and Language Therapy (SLT), which is where I come in. Speech and Language Therapy is necessary in a prison setting as a significant proportion of people in the criminal justice system will have speech, language and communication needs. Some research suggests that this may be as high as 91% (Brooks, 2011). Many of these people will not have accessed SLT in the past, and will have developed their own strategies in hiding their difficulties. This is why communication impairment is a hidden disability in this client group. Alongside this, people in prison experience much worse mental and physical health compared with the general population. There are more head injuries, more illnesses caused by drugs and alcohol, higher numbers of people with diagnosed mental illness and more people with conditions such as ADHD. The prison population is aging, so we have all the illness which link with an aging population too, such as strokes, dementia, cancers. You can see that as a service, we are going to be kept very busy! We’ve got lots of plans for how to tackle some of the things which we want to do as an SLT service, but something which we have already achieved is using Talking Mats. My first thought was how the men at Berwyn would respond to a conversation using a set of symbols and a doormat. Needless to say, they took it to without question – even the toughest looking customers who had been ‘inside’ for many years happily sat down with me to chat using the tool. Not only did they tolerate the Talking Mat, but they loved it – reporting that they were able to organise their thoughts and report their views more easily. To start with (and to ease clients into this way of sharing information) we tried Talking Mats about the problems faced by individuals at Berwyn. The question was ‘what do you feel about ________ at Berwyn?’ with symbols for the experiences and situations that men face during the day. It looked something like this: You can see that this gentleman was having some problems with his mental health, his computer in his room (which is necessary to book visits and make purchases), his memory and his weight. Other aspects of his life were OK such as family contact and care from the doctor. Some clients wanted to say more about emotions following completing the ‘problems’ Talking Mat. We used a ‘me’/’not me’ visual scale and symbols to represent emotions. This Talking Mat requires the client to have some emotional awareness skills so that they can recognise what they are feeling. Not all of the clients are at this stage, and it is especially hard for depressed people to access their emotions vocabulary (Bryan,2013). Here is an example of this Talking Mat. This information could be used as a starting point to develop an emotions safety plan with an individual. After completing this Talking Mat with a 21 year old man who has a significant history of Adverse Childhood Events, he wanted to make his own Talking Mat about his life experiences. This is a young man who finds expressing his emotions and past very difficult. I was quietly excited that he was prepared to share more information. We have sat together and used the symbol software to make his symbols, and next week I will get to see what he is going to tell me. And lastly, we have met some clients who have a diagnosis of an Autistic Spectrum Condition. They had attracted this diagnosis during their teen or adult years, but had limited understanding of what Autism is or how it affects them on a personal basis. Being in prison, they can’t Google to find out more as you and I might. We have developed a Talking Mat which explores ‘what is Autism?’ and allows the client to learn while they report on what having autism feels like for them. We hope to develop the responses on this Talking Mat into a person centred communication passport which can be shared to help all their communication partners. We keep thinking about ‘what next?’ with the clients and the SLT service, and we continue to develop symbol sets for more Talking Mats conversations. Often we are being led by the clients in terms of what they need in Talking Mat form. We have strong links in the wider team, so will be doing more Talking Mats work with psychology, substance misuse and nursing colleagues. We hope to access the Talking Mats Accredited Training and expand the number of people using Talking Mats to include Offender Managers and Prison Officers. Alongside this we are developing healthcare pathways for clinical work such as end of life care, so will be applying the Talking Mats methodology to advanced care planning. There’s a lot to do! Brooks, V., 2011. Report outlining the findings of a 13 month pilot project examining the effectiveness of speech and language therapy for young people known to Exeter, East and Mid Devon Youth Offending Team. East and Mid Devon Youth Offending Team. This entry was posted in Autism, Communication difficulties, Criminal justice and tagged Communication difficulties, justice, prison, Talking Mats on November 30, 2018 by Lois Cameron. 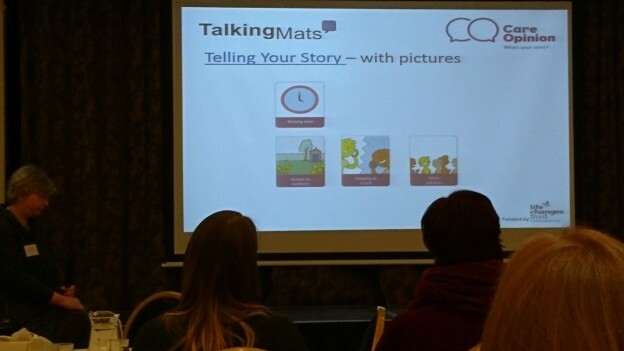 Talking Mats were delighted to be involved in the launch of Care Opinion’s Picture Supported stories at the Life Changes Trust Gathering in Perth Scotland this week. We have been working with Care Opinion for the past two years to develop this feature. This earlier Talking Mats blog describes the development process and this recent Care Opinion blog gives some examples of the feature in use. 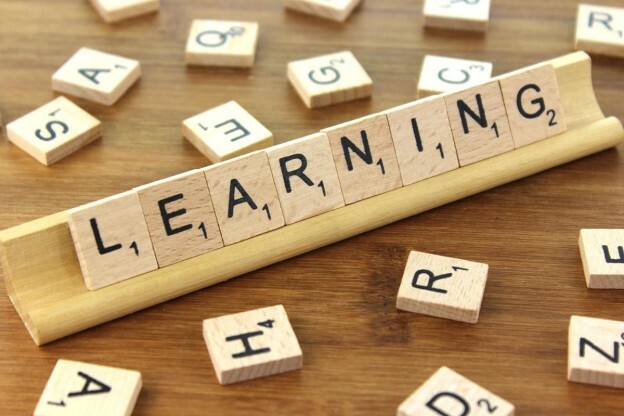 However, in this blog, I want to reflect on two events I went to within a short space of time; the gathering in Perth on Monday and the Royal College of Speech and Language Therapists study day the previous thursday in Stirling . It felt to me like my two worlds colliding or maybe it was just my stars aligning ! At the RCSLT study there was a session on the public perception of Speech and Language therapy and how there is still much work to do in changing the myths that are spun and repeated about what Speech and Language therapists actually do . For as John F Kennedy said in 1962 ‘ the great enemy of truth is very often not the lie but the myth , persistent, persuasive and unrealistic ´ The National Allied Health Professional children’s lead, Pauline Beirne suggested to the study day that Care Opinion is a great web site for encouraging that sharing of stories. Then, strangely when I got back into the office there was a story waiting for me in my in box all about the positive experience of a parent involved in a Hanen programme in NHS Lanarkshire which reinforced that very message. We know people relate to stories, stories resonate and have impact, they are easy to remember . Our drive in working in partnership with Care opinion was to support more people to tell their health and care stories by increasing accessibility . It was designed with and for people with dementia through funding from Life Changes Trust but anyone can use it and they are! It is great to see the stories coming in. Through stories let’s celebrate the good, develop and improve practice and let’s use stories to challenge myths and educate. So use Care Opinion and try out the picture supported stories to share your experiences , tell other people ,spread the word and the picture supported story feature ! This entry was posted in Aphasia, Autism, Communication difficulties, Dementia, Learning disability, Participation and tagged accessible information, Communication difficulties, Dementia, digital, Learning Disability, Mental Health, Participation, stroke on March 16, 2018 by Lois Cameron. Do you want to introduce Talking Mats to people with a communication disability and autism, but know they will need support to learn it? This entry was posted in Advance Care Planning, Autism, Blog, Communication difficulties, Legal and tagged Advance Care Planning, Autism, Communication difficulties, empowerment, Training on January 12, 2018 by Rhona Matthews.